TED Hose Thigh High Open Toe Anti-Embolism Compression Stockings by Covidien are thigh high compression socks that are designed to reduce venous stasis in the entire leg. It ensures blood flow and velocity with a compression pattern from the upper thigh down to the ankle. It comes with a circumferential knit inlay and an interrupted band that reduces slippage. 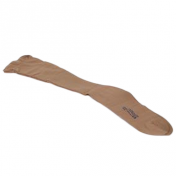 It has a pressure break that protects the popliteal area and promotes comfortable leg movement. It features a unique stitch pattern in the knee areas, which helps assist with pressure and positioning. It has a defined heel pocket that ensures correct placement and an inspection toes opening that provides easy access for medical examination. It is made from a soft material, which makes it highly comfortable for patient care. Is this product sold in Oklahoma city, OK? We are not aware of any outside retailers that sell this item. It's best to contact the manufacturer for information. I have ordered from this company several times and have been satisfied by their product and service. However, about Thanksgiving I placed another order which was billed to my credit card. I have not received that order as of mid December. After a number of inquires over this period of time, I finally received 4 different service ticket numbers, none of which really told me anything. Still no product, no answer and they have my money. This is a product that I really needed and, because I could get no response, had to purchase elsewhere. Now out double money. Unlikely I will be ordering anything else here. Product was size and model I ordered, promptly delivered, 6 pair for a reasonable price. Vitality Medical had the exact size and manufacturer in stock at a reasonable price. The correct product was delivered in a few days. The exact ones the hospital gave me after my knee replacement. After a few weeks of wearing them the elastic band did tear away from the hose, but since they were cheaper than most brands out there I wasn’t too disappointed. I was very impressed with how quickly they arrived, so I will most likely order again. These hose are exactly what I needed after my surgery. They were the same quality as the ones from the hospital and the price was very good. These compression stockings were the exact same size the hospital fitted me with after my hip replacement surgery. They arrived on time, and fit perfectly. If I need more, Vitality Medical is where I will return for them. I've been using TED hose for almost 10 years already. The last set I have lasted for almost 2 years. But this new one I just purchase just on my second use it run like regular stockings. Now I need to find a different brand that has better quality. cost was a rip off! I could of mailed these for about $3.50 and they charged me $11.00. Watch Out! Also you can go to the postage and get the envelope for a fixed price of $4.95. For the reason I will not purchase from them again. Precisely what I needed to purchase in a quantity I needed with overnight service. It could not have been a better transaction.